Looking back in pop music history, you’ll find certain voices that were made for one another. Think about it: What would “Cathy’s Clown” have sounded like if it had only been Phil and not Phil and Don Everly on vocals? Would “The Sound of Silence” have been as powerful if Paul Simon or Art Garfunkel had sung it alone? Like the aforementioned musical giants, songbird Emily Kelly has a voice that is lovely in its own right. Fellow Scot Graham Coe can more than carry a tune. Put them together and magic happens. In fact, Coe and Kelly possess an extremely rare ability to make their two voices move as one. 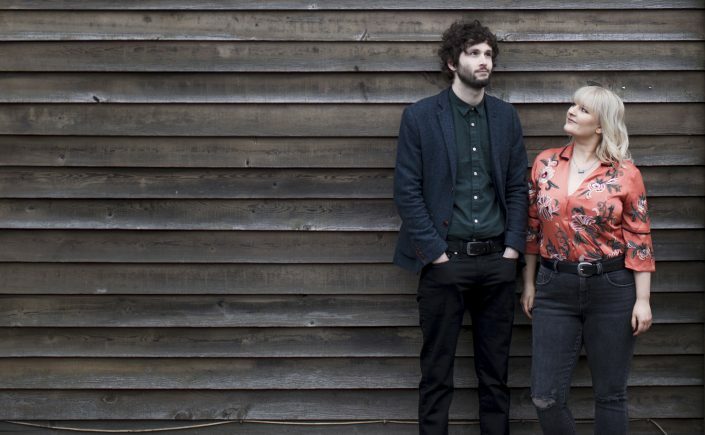 That dynamic, more than anything else, is what makes Edinburgh-based acoustic duo The Jellyman’s Daughter such a captivating listen. Their recently-released second album Dead Reckoning is not a blues album. What’s it doing here then? I like to think most blues fans can appreciate good sounds regardless of genre. The music of The Jellyman’s Daughter is often very ambitious in its scope, but it is also rootsy. It’s got one foot in the concert hall, the other on a remote mountain trail. I’ve tried coming up with a catch-all way of describing it – “orchestral bluegrass” perhaps? – but that doesn’t quite do it. I hear elements of country, bluegrass and Celtic music, funk, soul and the blues. The instrumentation is bold and eclectic. Both Emily Kelly and Graham Coe play guitar and mandolin, and Coe’s rich bowing on the cello features prominently. The banjo of Jamie Francis lends many of the cuts on Dead Reckoning an Appalachian flavor. The sixteen-piece string orchestra conducted by Luci Holland gives widescreen impact to tracks like “Quiet Movie,” “Oh Boy” and the title song. The folk-funk instrumental “The Shoogly Peg” is littered with blue notes. And then there’s “Cry, Cry Darling,” a country hit for Grand Ole Opry regular Jimmy C. Newman in 1954 that has since been covered by artists including Dolly Parton, Ronnie Milsap, Willie Nelson and Hank Williams Jr. None of the versions I listened to sound quite as lonesome and desolate as Kelly and Coe’s stunning minor-key reading of the song. There is nothing showbiz about it; The Jellyman’s Daughter express themselves with haunting elegance. No disrespect to the country legends mentioned above, but I’d bet there is no more deeply moving rendition of the song than this one. It may not be blues, but it is certainly blue.